A few months ago I decided to get the Lunar Duo because, well, it seems to be an awesome tent! It is quite roomy, uses my trekking poles to set it up so I don’t have to carry extra tent poles, and due to this, it is pretty light-weight, especially when you consider the amount of room it offers. So, I was happy to spend the small chunk of change to get the Lunar Duo to replace my heavier, smaller Kelty Grand Mesa 2. Since I received the tent I have used it a few times, both in my yard as well as in the Smokies. Overall, I am quite happy with the tent, but I do have one issue with it, and that’s the floor. The floor in the Lunar Duo is actually a floating floor. What I mean by this is that the tent is actually a tarp (single wall), and once it is pitched using my trekking poles and (at a minimum) 6 stakes, the floor hangs down from the perimeter of the tent by a no-see-um mesh. So, the floor literally hangs from the roof of the tent, however, there is an elastic cord at each corner of the bathtub style floor that stretches out to the corresponding corner of the tent which manages to hold the floor in place, somewhat. The floor is made using a 30D ultralight silnylon, and anyone that has put their hands on a piece of silnylon knows one thing, it it slick! Now just imagine this slick material as the floor of your tent, and not stationary at that. What I have found is that even on the slightest of slopes the floor will actually begin to slide away. My problem with that is that I don’t want to wake up in the morning from either sliding into my trekking pole and knocking it down, or worse, wake up and realize that the floor has slid far enough away to actually tear away from the tent! I eventually decided to use some SilNet and make lines and circles on the outside bottom of the floor, hoping that this would provide enough grip to keep the floor in place. So, I laid my tent out, grabbed some latex gloves and the remainder of my tube of SilNet… I began by putting dots spaced about 10″ apart and then going back and using my finger to spread it out. I did two rows of this and then decided to use a full horizontal line since I was getting nearer the middle. I alternated another row of dots with another full horizontal line and then finished out the remainder with dots. The entire process took me about 10 minutes once I got it all together. After that I let it sit undisturbed for almost a full day (about 20 hours). Then I started wondering if I should powder the dots. The reason I say this is because the first time I used SilNet I had some issues. I sealed some MLD eVENT mitts and let them site for well over 24 hours (more like 36). Once I felt that they were dry, I unstuffed them and rolled them up together and stored them away. When I next pulled them out, well, they were stuck together pretty well… So, with my tent, I tested one of the dots. I folded it over on itself and applied a large amount of pressure for about 30 seconds. When I released I expected it to be stuck down, but it came right up! This entry was posted in Gear, Tent and tagged Grand Mesa 2, Kelty, Lunar Duo, SilNet, Six Moon Designs. Bookmark the permalink. Why the outside; you will still slide all around on the inside no? My NeoAir is actually quite tacky on the bottom so it does a pretty good job at staying in place. Due to this, I have not had too many concerns with sliding around on the inside. But I dunno, I may put a few little dots inside too once I get some more SilNet. Hey Stick, it will be interesting to see how this works, since I have the Lunar Solo and have had the same problem once or twice. 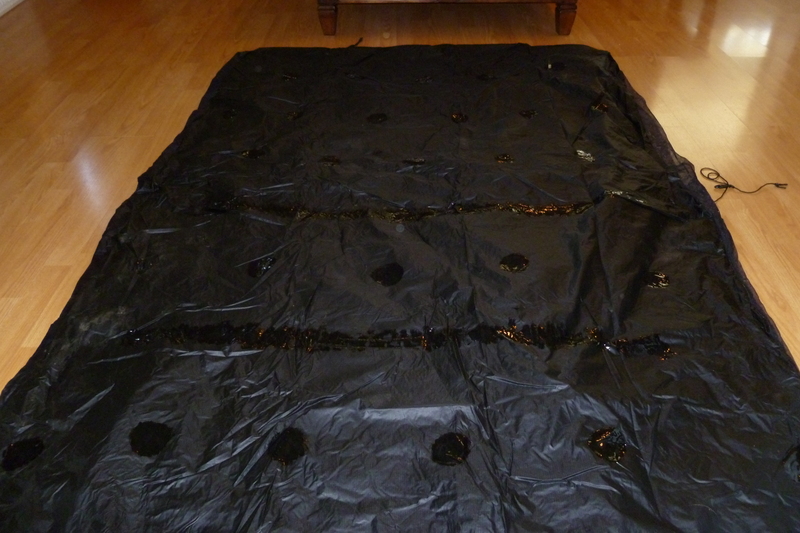 The first time, I pulled the plastic ground sheet out from under it; that helped a little, but I sure hated cleaning the junk off the bottom of the tent the next morning.